Lake Point Tower is a high-rise residential building located on a promontory of the Lake Michigan lakefront in downtown Chicago, just north of the Chicago River at 505 North Lake Shore Drive. It is located in the Streeterville neighborhood of the Near North Side community area. It rises somewhat apart from the urban cluster of downtown Chicago in a composition that sets off and punctuates the skyline. 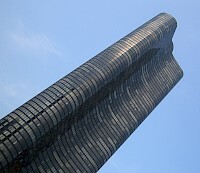 The building is also the only skyscraper in downtown Chicago east of Lake Shore Drive.